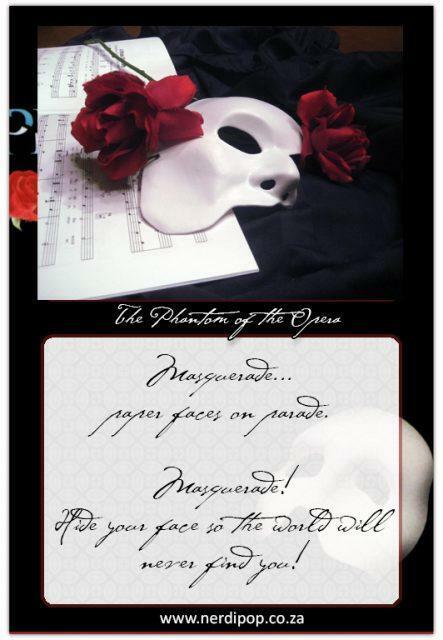 “Masquerade… paper faces on parade. Masquerade! 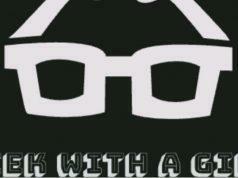 Hide your face so the world will never find you! The Phantom of the Opera (French: Le Fantôme de l’Opéra) is a novel by French writer Gaston Leroux, first published in 1909 to 1910 as a serial. In April 2010, it was first published as a novel by Pierre Lafitte. The novel is partly inspired by historical events at the Paris Opera during the nineteenth century and an apocryphal tale concerning the use of a former ballet pupil’s skeleton in Carl Maria von Weber’s 1841 production of Der Freischütz (source:Wikipedia). The most notable of these are the 1925 film depiction featuring Lon Chaney and Andrew Lloyd Webber’s 1986 musical. 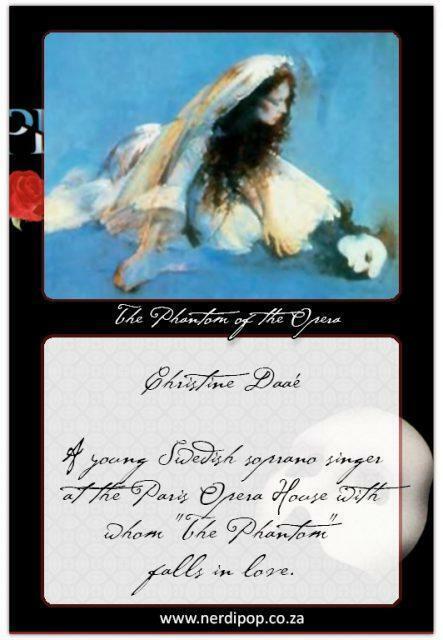 Christine Daaé: A young Swedish soprano singer at the Paris Opera House with whom “The Phantom” falls in love. 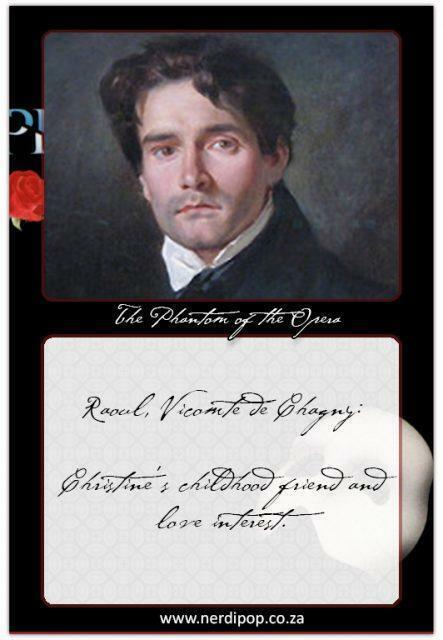 Raoul, Vicomte de Chagny: Christine’s childhood friend and love interest. 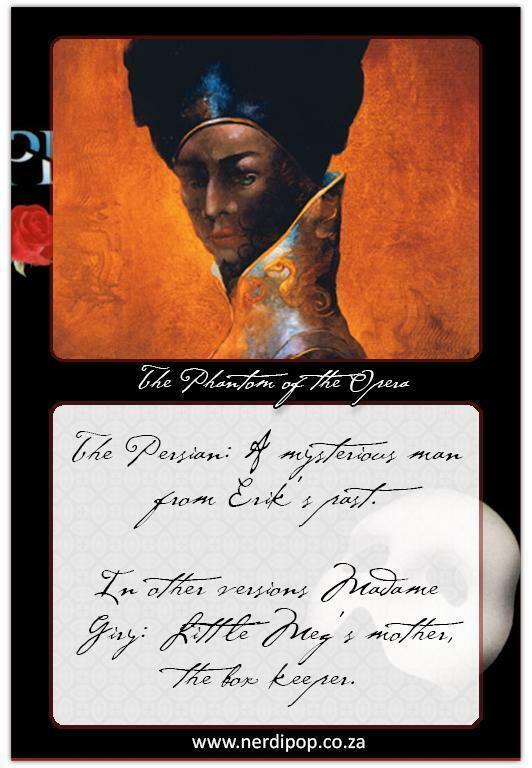 The Persian: A mysterious man from Erik’s past.In other versions Madame Giry: Little Meg’s mother, the box keeper. La Carlotta: A spoiled prima donna; the lead soprano of the Paris Opera House. Meg Giry: Madame Giry’s only daughter, a ballet girl. Later becomes Mme. la Baronne de Castelot-Barbezac. 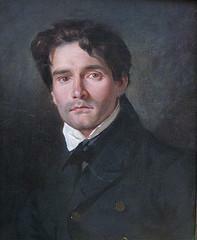 Joseph Buquet: The chief scene-shifter.Philippe, Comte de Chagny: Raoul’s older brother. Debienne and Poligny: The previous managers of the opera house. Mercier: The acting manager of the opera house. Gabriel: The superstitious chorus master. Mifroid: The commissary of police called in for Christine’s disappearance. The inspector: An inspector hired to investigate the strange affairs concerning Box Five. Shah and the sultan: The two kings that tried to kill Erik after he made them a palace. 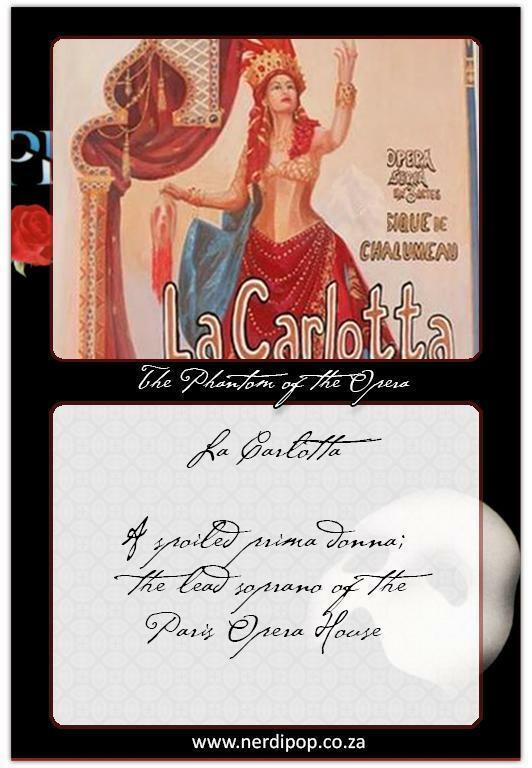 La Sorelli: the lead ballerina, with whom Comte de Chagny spent time. Little Jammes: A mentioned Ballerina at the Opera House. Opera singer Christine triumphs at the gala on the night of the old managers’ retirement. 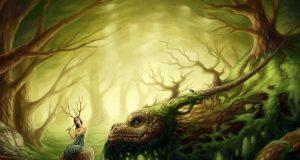 Her old childhood friend, Raoul, hears her sing and recalls his love for Christine. At this time, there are rumours of a phantom living at the Opera and he makes himself known to the managers through letters and malevolent acts. Sometime after the gala, the Paris Opera performs Faust, with the prima donna Carlotta playing the lead, against the Phantom’s wishes. 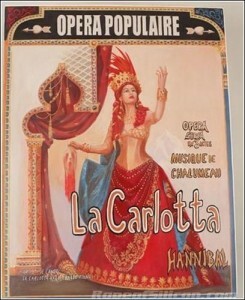 During the performance, Carlotta loses her voice and the grand chandelier plummets into the audience. 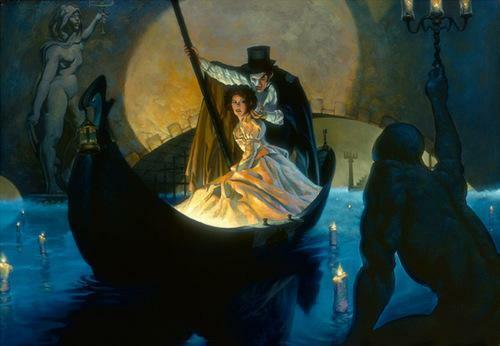 Christine is kidnapped by the phantom and is taken to his home in the cellars of the Opera where he reveals his true identity to her simply as Erik, though not his real name. He plans to keep her there for a few days, hoping she will come to love him. But she causes Erik to change his plans when she unmasks him and, to the horror of both, beholds his nose-less, lipless, sunken-eyed face which resembles a skull dried up by the centuries, covered in yellowed dead flesh. Fearing that she will leave him, he decides to keep her with him forever, but when Christine requests release after two weeks, he agrees on condition that she wear his ring and be faithful to him. On the roof of the opera house, Christine tells Raoul that Erik abducted her. Raoul promises to take Christine away to a place where Erik can never find her. Raoul tells Christine he shall act on his promise the next day, to which Christine agrees. She, however, has pity for Erik and will not go until she has sung a song for him one last time. Neither is aware that Erik has been listening to their conversation and that he has become extremely jealous. The following night, Erik kidnaps Christine during a production of Faust and tries to force Christine to marry him. He states that if she refuses, he will use explosives (which he has planted in the cellars) to destroy the entire opera house. Christine refuses, until she realizes that Erik learned of Raoul’s attempt to rescue her and has trapped Raoul in a hot torture chamber (along with the Persian, an old acquaintance of Erik who was going to help Raoul). To save them and the people above, Christine agrees to marry Erik. Erik initially tries to drown Raoul, using the water which would have been used to douse the explosives. 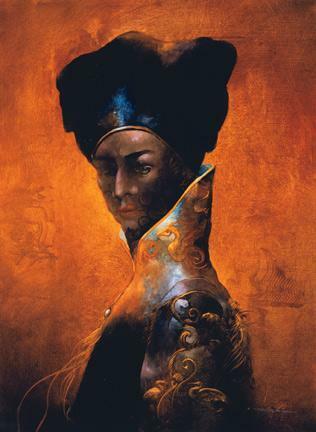 But Christine begs and offers to be his “living bride”, promising him not to kill herself after becoming his bride, as she had both contemplated and attempted earlier in the novel. Erik eventually rescues Raoul from his torture chamber. When Erik is alone with Christine, he lifts his mask to kiss her on her forehead, and is given a kiss back. Erik reveals that he has never received a kiss (not even from his own mother) nor has been allowed to give one and is overcome with emotion. Erik allows them to escape, though not before making Christine promise that she will visit him once on his death day, and return the gold ring he gave her. He also makes her promise that afterwards she will go to the newspaper and report his death. 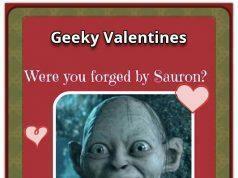 Indeed, some time later Christine returns to Erik’s lair, buries him and returns the gold ring. Afterwards, a local newspaper runs the simple note: “Erik is dead” (source: Wikipedia). They cross a subterranean lake to his secret lair beneath the opéra house. 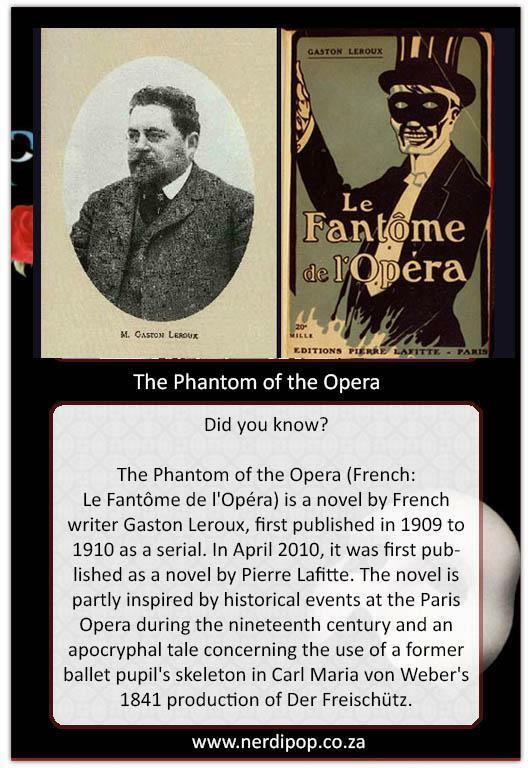 The Phantom explains that he has chosen Christine to sing his music and enchants her with his own sublime voice. (“The Music of the Night”) Christine sees a mannequin resembling herself in a wedding dress, and when the mannequin suddenly moves, she faints. The Phantom picks her up and places her gently on a bed. 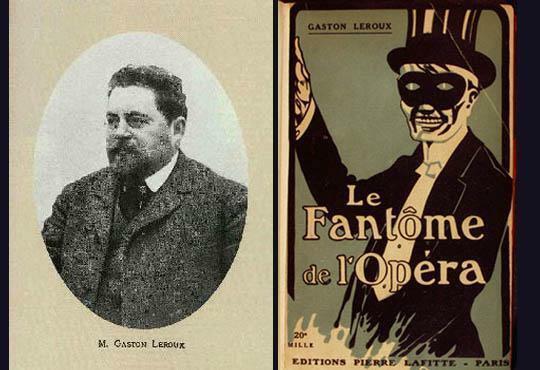 Meanwhile, inside the opéra house, Joseph Buquet, the Opéra’s chief stagehand—who, like Madame Giry, inexplicably knows much about the Phantom—regales everyone with tales of the “Opéra Ghost” and his terrible Punjab lasso. (“Magical Lasso”) Madame Giry warns Buquet to exercise restraint. 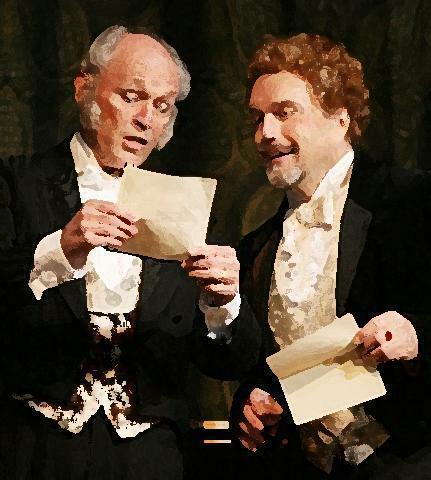 In the managers’ office, Madame Giry delivers a note from the Phantom: He demands that Christine replace Carlotta in the new opera, Il Muto, or there will be a terrible disaster “beyond imagination”. (“Notes…”) Firmin and André assure the enraged Carlotta that she will remain the star, (“Prima Donna”) but during her performance, (“Poor Fool, He Makes Me Laugh”) the Phantom reduces her voice to a frog-like croak. A ballet interlude begins, to keep the audience entertained—but a series of menacing shadows can be seen on the backdrop. Suddenly the corpse of Buquet, hanging from the Punjab lasso, drops from the rafters. Firmin and André plead for calm as the Phantom’s diabolical laughter is heard. In the ensuing mêlée, Christine escapes with Raoul to the roof, where she tells him about her subterranean rendezvous with the Phantom. Raoul is skeptical, (“Why Have You Brought Me Here?/Raoul, I’ve Been There”) but swears to love and to protect her always. 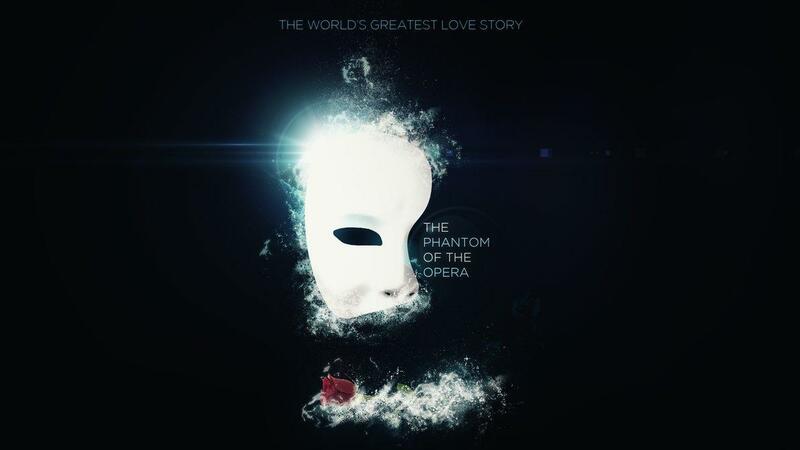 (“All I Ask of You”) The Phantom, who has overheard their conversation, is heartbroken. As he angrily vows revenge against Raoul, (“All I Ask of You (Reprise)”) the Opéra’s mighty chandelier crashes to the stage as the curtain falls. Six months later, in the midst of the gala masquerade ball, the Phantom, costumed as the Red Death, makes his first appearance since the chandelier disaster. (“Masquerade/Why So Silent?”) He announces to the stunned guests that he has written an opera entitled Don Juan Triumphant. He demands that it be produced immediately, with Christine (who is now engaged to Raoul) in the lead role, and warns of dire consequences if it is not. He seizes Christine’s engagement ring and vanishes in a flash of fire and smoke. Raoul demands that Madame Giry tell him about the Phantom. She reluctantly replies that he is a brilliant musician and magician born with a terrifyingly deformed face, who escaped from captivity in a traveling freak show and disappeared. During rehearsals, Raoul hatches a plan to use Don Juan Triumphant as a trap to capture the Phantom, knowing the Phantom will be sure to attend its première. (“Notes/Twisted Every Way”) Christine, torn between her love for Raoul and her gratitude for the Phantom’s teaching, visits her father’s grave, longing for his guidance. (“Wishing You Were Somehow Here Again”) The Phantom appears, again under the guise of the Angel of Music. (“Wandering Child”) Christine nearly falls under his spell, but Raoul arrives to rescue her. The Phantom taunts Raoul, launching fiery missiles at him, (“Bravo Monsieur”) until Christine begs Raoul to leave with her. Furious, the Phantom sets fire to the cemetery. Don Juan Triumphant opens with Christine and Ubaldo Piangi, the Opéra’s principal tenor, singing the lead roles. (“Don Juan”) During their duet, Christine suddenly realizes that she is singing not with Piangi, but with the Phantom himself. (“The Point of No Return”) He expresses his love for her and gives her his ring, but Christine rips off his mask, exposing his deformed face to the shocked audience. 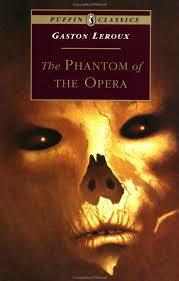 As Piangi is found strangled to death backstage, the Phantom seizes Christine and flees the theatre. An angry mob led by Meg searches the theatre for the Phantom, while Madame Giry directs Raoul to the Phantom’s subterranean lair, and warns him to beware his Punjab lasso. In the lair Christine is forced to don the doll’s wedding dress. (“Down Once More/Track Down This Murderer”) Raoul arrives, but the Phantom captures him with his lasso. He tells Christine that he will free Raoul if she agrees to stay with him forever; if she refuses, Raoul will die. 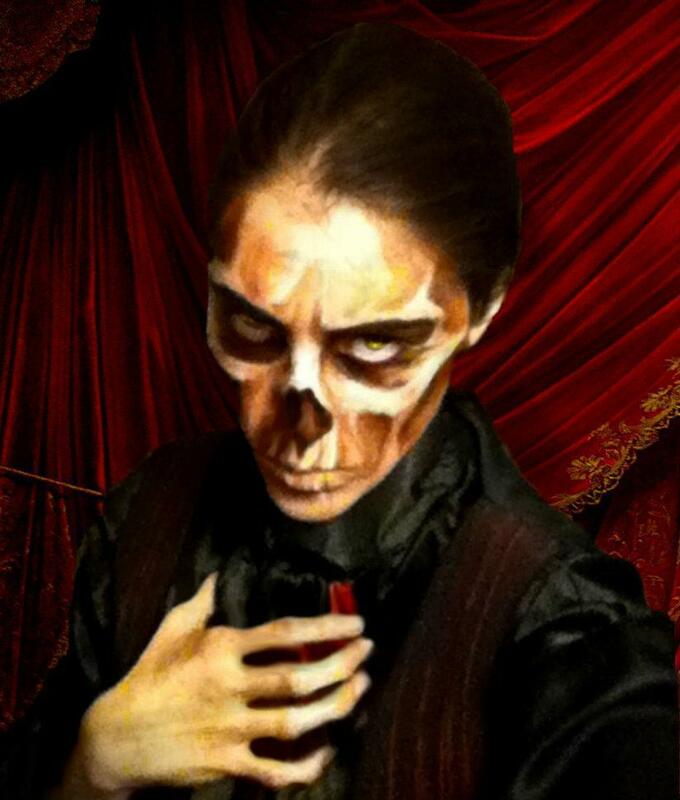 (“Final Lair”) Christine tells the Phantom that it is his soul that is deformed, not his face, and kisses him. The Phantom, having experienced kindness and compassion for the first time, sets them both free. Christine returns the Phantom’s ring to him, and he tells her he loves her. She cries, forces herself to turn away, and exits with Raoul. The Phantom, weeping, huddles on his throne and covers himself with his cape. The mob storms the lair and Meg pulls away the cape—but the Phantom has vanished; only his mask remains (source: Wikipedia).